We are beginning to get phone calls from polsters asking who we are going to vote for. Who knows, we may even get one of the parties knocking on our door. We are not obliged to tell anyone who we are going to vote for, voting – unless you apply for postal voting – is still a secret between yourself and the voting slip. However, I am prepared to stand up and be counted. I will tell all who are willing to listen what my voting intentions are. I will check my areas candidates list, the day before the election, and will vote for anyone who has signed the “British Declaration of Independence”, linked here. It is highly unlikely that more than one candidate will have signed this. Veritas candidates will have no problem with this. The ordinary candidates of the UK Independence Party may have done so as well. However, I doubt the senior members will. I secretly suspect they have been seduced by the huge payments they receive from the EU in salaries and expenses and now, no longer want to leave the EU. Most of the Labour candidates are hell bent in keeping us in the EU. The Conservatives have ordered their candidates not to sign it and the Liberal Democrats think it’s life giving manna that comes out of the EU’s arse, instead of endless reams of crap! If no candidate on my constituency has signed the BDI, then the only option for me to do is to use a large black felt pen and write “They are all a bunch of bankers” across the ballot paper. No charge of indecency could be brought, but everyone knows what was meant! The British Declaration of Independence is the new name for the South Molton Declaration which, at the last general Election, asked candidates to commit to a Bill asserting the Sovereignty of the British People by voting for an Act of Parliament. In all some 100 MPs or Candidates either signed or gave their full support without signing. 42% of all voters would switch their vote to another candidate who had signed or WOULD NOT VOTE AT ALL if their own candidate refused to sign. 34% of Labour voters would either vote for a different candidate who had signed (24%) or would not vote (10%) and 41% of Liberal Democrat voters would either vote for a different candidate (31%) or would not vote (10%) if their own candidate did not sign. An extraordinary 55% of Conservatives would not vote for their preferred candidate (40% would switch to a candidate who had signed and 15% “would not vote”) if their candidate did not sign. No fewer than 72% of younger Conservative voters (age 18-24) would either vote for a different candidate who had signed (40%) or would not vote (32%) if their preferred candidate did not sign. The small turnout of 59% of the electorate (a 14% drop on the 1997 Election) shows how people increasingly refuse to vote for those who refuse to govern. This was a vindication of our Constitutional Campaign then – and of the British Declaration of Independence today. But most important of all we set out the strategy by which our democratic nationhood and the sovereignty of the British people will be asserted in Parliament. We have provided the means by which voters and candidates could remain with their traditional politics and yet re-assert the sovereignty of the people and reclaim their parliamentary authority. But I hadn’t my original receipt and they wouldn’t accept it without proof of purchase, even though the camera hadn’t been out a full year yet. I asked and spoke to the manager and it was agreed that I could ring my wife and ask her to fax the receipt in. Whilst we were waiting we had an animated discussion about wines of all subjects and eventually my wife phoned to say she could not find the receipt. I hadn’t purchased the camera from Jessops but the service is for all Minolta owners whereever they bought their camera. Meanwhile the manager of Jessops in New Oxford Street had read my letter and said he sympathised with me, and as one wine lover to another, he would swop it – there and then – for a new camera. Said he would then make damn sure he would get a new camera out of Minolta. Jessops have a lot of clout as they probably sell more of every manufacturers cameras than any other computer company (they have a chain of 74 shops throughout the UK and are planning to expand soon to 100). So I left the store with a brand new Minolta D7 DSLR with renewed faith that there are still some good guys around. Yes, dear reader, I am also sure he wasn’t a shareholder! I have been a loyal Minolta customer using a Dynax 7 and a Dynax 9 and also a Dimage 7Hi patiently waiting for your entry into the professional digital market. The battery life is very bad… The Minolta NP-400 lasts about a quarter of the time that my colleague’s Canon DSLR lasts (he accompanied me for one week of a recent three week trip to the Cape). His battery is also an NP-400. Admittedly I had the camera set on IS all the time but he has the IS on his lens on all the time as well.. But should that mean a loss of three quarters of the power? Even taking into account my larger 2.5 inch viewing panel? In addition, If I don’t turn off the camera and it goes into snooze mode, the battery quickly drains and the right hand side of the camera becomes very very hot. Should it do this? Further more, if I don’t turn on the camera and immediately take a photograph and then turn off the camera instantly, the camera freezes and I have to take out the battery and re-inset it. This happens about sixty to a hundred times a day! Sometimes when the camera freezes I get a Syntax Error – Are you using Windows software here? The focussing seems awry… The photographs I take are never 100% in focus but when I shoot with my colleagues Canon, all my photographs are perfectly in focus. The separate hand grip enclosed also gives me problems when I use it and I am wondering whether it is making good contact with the camera contacts. I am a journalist and photographer. My assistant and I have just returned from a three week trip to South Africa which cost £4,000 and, although not entirely wasted, has caused me much embarrassment in front of interviewees, making me seem a rank amateur, and I could have taken a further 2,000 photographs with well-functioning equipment. I have published my problems on Cix (A private Internet Forum) and have been advised by a solicitor who has a Canon that the Konica-Minolta Dynax D7 DSLR which I have purchased is not of “merchantable quality” and I should contact my own solicitor. But I would like to hear your comments before I do. There have been many ribald comments about my stupidity in purchasing Minolta but I do take these with a pinch of salt. Please reply with your comments as soon as possible so that I can contact my solicitor for his advice before taking further action. My business standing has been called into question because of your equipment. This makes me extremely unhappy. Thank you for your email . I am sorry to hear you have been having such a lot of trouble with your Dynax 7D camera. It is difficult to be certain just from a description, but the array of different faults suggests a malfunction in the camera’s main circuit board. I have asked for the camera to be brought to my attention when it arrives in Milton Keynes, and will have someone carry out a full examination, to establish the exact nature of the faults. I am sure we will be able to resolve the situation quickly and to your satisfaction. So perhaps all the fiddley things that have been plaguing me have all stemmed by a bad circuit board. Perhaps there is a useful trigger we can retain in our memories for when we start having all those silly problems with our computers. 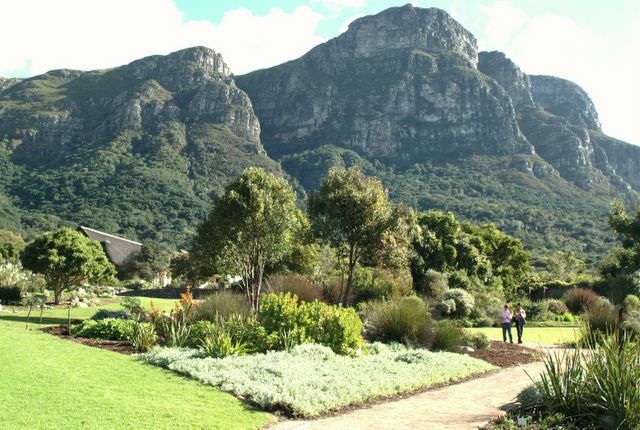 On our last day in South Africa – (Monday) we drove to the famous Kirstenbosch Botanical Gardens. They were beautiful and after walking around this huge enclave we collapsed in the tea rooms for our morning coffee. There were several tables put together for a private party with a red and purple motif everywhere. Shortly afterwards a group of middle aged ladies descended upon the cafe… a little like locusts! Smiling, friendly, bubbly and laughing all the time. And the amazing thing was, they were all wearing large red hats of different sizes and hues, and all had purple tops, or coats, also of different hues. Their leader told me they were one of 22,000 chapters of the Red Hat Society around the world. First started in America by a fifty year old lady named “Sue Ellen Cooper” because she felt that life was just beginning, not ending, the society is principally engaged in raising money for charity – a little like the Masons, but unlik the masons, don’t go in for rituals and is not secret. Jo Maxwell handed me her card which proclaimed her HRH Jo Maxwell, Queen of the Red Hat Renegades, as the Cape Town Chapter is known. And I will tell you, they were fun to talk to and fun to observe as I returned to my table. There are some chapters in England but not very many alas. I have added their website below and will warn you that although it looks slick, and professional, and commercial – I am told that the society is not a commercial organisation but a charity. At 6:05am. First off the plane, first through passport control, and last to receive all my baggage from the carousel… isn’t it typical? You’re on a winning streak and it all goes haywire. But I will have a lot of stories to tell you, as soon as I get my sleep routine sorted out. But enough to say that, in the Cape Winelands, I felt a lot safer than I do in London. On the whole, the South African natives and coloureds are gentle and very optimistic. Of course there are those that are more aggressive but they are truly a minority. And many of them have come down to South Africa from the North. For example, the new South African police freely admit that the drug problem in South Africa is mainly controlled by Nigerian Overlords. One senior policeman jokingly told me that they get the ones that don’t make it to Britain! More as I get my bearings back, and some lovely photographs – I hope – when I sort those out as well! It’s going to be a long hard grind in Photoshop! Just found Corsinet.com, a huge website full of trivia. In addition to this, their links site is an alphabetic list of site which contain full information on each subject listed. Marvellous if you can’t find what you are looking for in your favourite search engine. Well, we will soon be off to sunny Stellenbosch. For example I have just checked the weather and there is not a cloud in sight for the five day forecast for Cape Town and the temporature is between 25 and 29 degrees over the same period. 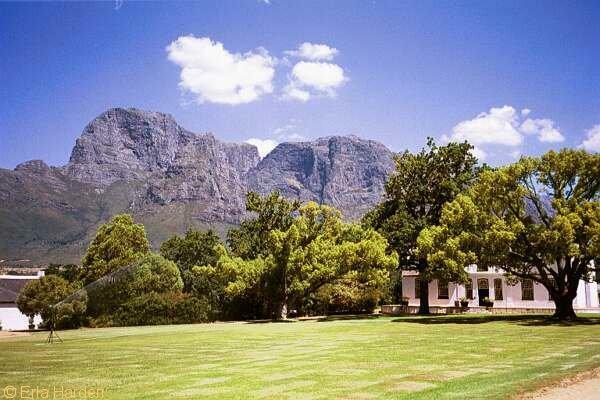 We are going to Stellenbosch, about 45 kilometres East of Cape Town. The above photograph is a picture of the street where our flat is. Now there is some good news and some bad news in that. The good news is that temporature is about two degrees hottor in Stellenbosch as it is away from the wind that blows across Table Bay (Daar is ‘n wind wat blaai) Lovely song called “There is a wind that blows”. Anyway I digress! Now the bad news. Without that wind, whereas Cape Town can be sunny, Stellenbosch may occasionally attract a little cloud. But “hey” I can live with that and we will be going to Cape Town now and again! 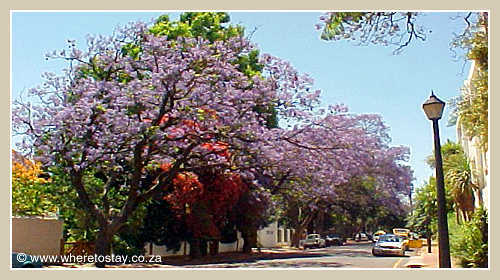 We rent a two bedroom flat right in the centre of Stellenbosch – just two minutes walk from the main shopping street. We have a good friend from Nottingham who is coming out for our “middle” week and we are going to take him to a couple of wineries, all around the winelands and for two days we will make a base in George and take a half day in Knysna and a full day in Oudtshoorn where we will visit the famous Cango Caves, an Osterich Farm and the Wildlife Park where one can see, Meercats, Crocodiles, Lions, Leapards and Cheetahs and many other specis – including snakes!. This will be my last blog until the end of April. That is not a definitive statement, but enough to give you a warning. I am sure, at different times, I will have some access to computers over there and if so, I will put up an occasional blog. We arrive back on the 26th April so, between the 27th and 31st, in between a huge job of organising a couple of thousand photographs with Photoshop, I may put up some short blogs with many photographs. So please, if you get bored with little to see, do make a note in your diary to come back in May.